Finally, the milestone of lost teeth. While families everywhere are busy carving out beautiful crooked smiles in their big, round pumpkins, I have been busy making room for big girl teeth in Miss Maylie’s mouth. And let me tell you what is not in the baby books — pulling teeth. Never once did I read that one day I would have to wiggle and twist and “break the roots” (as GG calls it) of my own child’s teeth. Sure, I read all about what to expect when those same teeth were coming in. But never was it written that one day, I would be forced to pull out those same teeth that gave us both many sleepless nights. For a few years now, Maylie has been telling me that her teeth were loose. You see, most of her friends (and cousins) are older and have all lost teeth. She could not wait until it was her turn. But every time I would check, those baby teeth were holding their ground. When she told me this last time that her tooth was loose, I was prepared to give her my usual response, “maybe just a little, but I don’t think it is ready yet.” To my surprise, this time, it was actually loose! Not only that, but the one next to it was wiggly as well. Now let me tell you something about me. When I was a kid and had even the slightest movement in a baby tooth, you can bet that within 24 hours it was out. But not my Maylie. She has that calm, patient (sometimes ha!) temperament like her father and was willing to just let it fall out when it was ready. Which would have been fine had I not caught a glimpse from up above and noticed two little white, jagged permanent teeth poking through. For a week or two, I let it go. She wanted to let them “fall out” and I wasn’t going to force the issue. That is, until her teeth started getting not so loose. With no room to come in, the big teeth were almost tightening the little teeth in front of them in the gums. I knew I had to take action. So, I did what every grown woman would do. I called my mom. Equipped with dental floss to try the tie-and-slam-the-door approach, as well as cupcakes and cookies for bribery (aren’t grandmas the best), my mom came right over. I am still not sure what you are supposed to use to tie onto your child’s tooth so that it actually stays and you can attempt to slam a door, but it is not dental floss. And, even if it is, good luck getting them to keep it on. Every time we got close to getting a knot secured on that itty, bitty tooth, it just slid right off. It was time to take matters into my own hands — literally. I am not going to lie, I thought about just calling the dentist and letting him do it. Look, I am not a fan of causing my child pain. However, I am also not a fan of outrageous dental bills for something that could clearly be handled at home. Handing Maylie a phone for distraction and wrapping her arms around her, GG sent some encouragement both Maylie and my way and I started twisting. The first one came out without a tear — well, maybe a few once she saw the blood. Which made the second one — the one that was not quite as loose — even harder. But, after much coercing, I was able to pull that one free as well. Then, the tooth fairy talks began. Funny thing is, her biggest wish from the tooth fairy was to keep one of her teeth. She went to work on a letter to make sure the tooth fairy knew where to find her teeth and asked that I send an extra letter for her request of keeping a tooth. After some discussion with the fairy, it was decided that we could make that happen. Never have I seen someone so excited to wake up to their tooth! Sure, there were a few dollars as well and the tooth fairy just so happened to have her favorite toy on hand (I mean it was two teeth and all), but the excitement on her face made my heart smile. And so begins the glamorously awkward stage of grown-up teeth. Gone is my little girl’s beautiful baby smile replaced by the unhandy, hilly tops of big girl teeth. But, to me, she is the cutest jack-o’-lantern around. Plus, at this rate, it could be a really cheap Christmas if all she wants are her two front teeth. 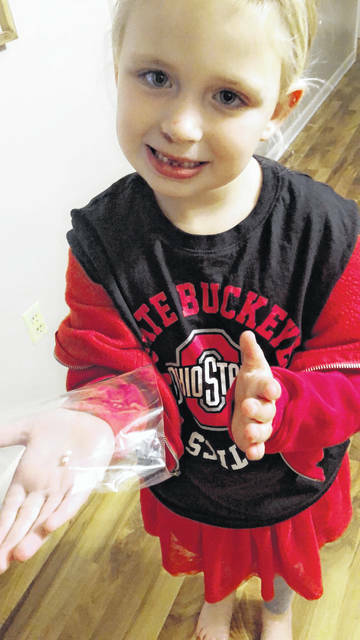 https://www.limaohio.com/wp-content/uploads/sites/54/2018/10/web1_tooth.jpgFinally, the milestone of lost teeth. Sarah (Pitson) Shrader was born and raised in Lima. She is a Lima Central Catholic and Tiffin University graduate. Sarah is a full-time working mama who enjoys writing about her somewhat crazy, always adventurous life as a mother. 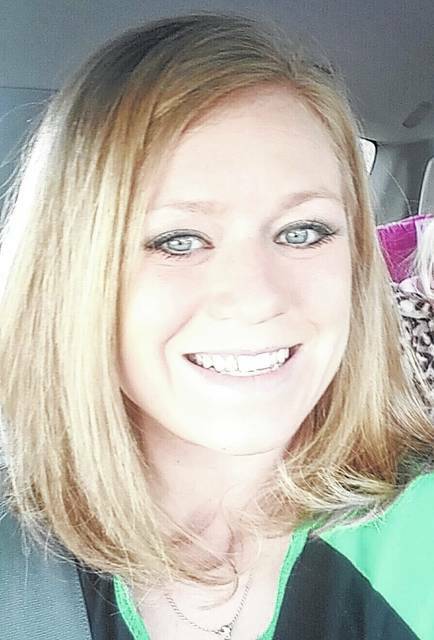 She lives in Bath Township with her husband, Paul, and their daughters, her writing inspirations, Maylie and Reagan.